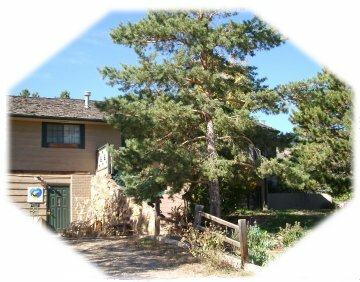 Avalon Aviary is found in the heart of the Rocky Mountains in Loveland, Colorado. 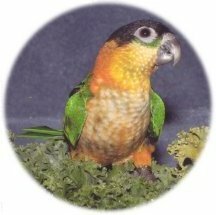 We are a Model Aviculture Program (MAP) certified parrot breeder whose healthy, highly socialized companion parrots are raised with love and the best techniques to ensure their proper physical, emotional, psychological development and socialization. We also have a wonderful bird supply store as a part of our facility where you can purchase everything your pet birds need, and we have a knowledgeable staff to help you make great selections. Avalon Aviary's name comes from the legendary Isle of Avalon found in Arthurian Legends. This island was a mystical place of healing and sacred teachings, a sanctuary one only found if invited. Unlike the mythical isle, our aviary has a standing invitation - if you love birds, please feel free to visit. Avalon Aviary received a perfect Model Aviculture Program (MAP) certification score. According to Bird Talk 1/97, "you can be assured of a certain level of husbandry and professionalism by buying birds from a MAP-certified facility." Thus, when you purchase a bird from Avalon Aviary, you can know you're buying from the best. 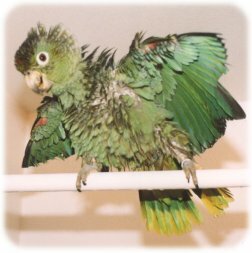 As a parrot breeder, we specialize in happy, well-adjusted companion parrots. Confident, highly socialized babies can be your friends for life. Our baby parrots start out under their parents and then are brought into our intensive care nursery. There, they receive lots of nurturing and gentle handling; they start out in the world feeling safe and secure. As the parrot babies develop, we add different colors and textures of toys and foods to explore with curious beaks and tongues. When they are ready, we move them from environmentally controlled brooders to natural baskets draped with colorful towels across their handles which are contained in playpens that we have in the nursery. From these baskets, which resemble natural nests, they decide when they are brave enough to peek out of their "nests" and eventually come out on their own. When they are brave enough, we move the playpen into the family room where they learn to fly, first by flying from one basket handle to another, or from one playpen to another, eventually from playstand to playstand. As they develop good flying and landing skills we gradually trim their flight feathers so they gain strength and skills without gaining speed. When they are ready, we move them into cages in our parrot playroom. From the time they hatch they are raised with special socializing procedures. Good behavior is lovingly rewarded and boundaries are set at an early age. Our juvenile parrots are exposed to lots of common household items so they are familiar with them. They are socialized with different humans, both men and women. Our parrots are also raised with a variety of other parrots, so they know how to be birds and have bird manners, too. Before anyone can purchase a bird from Avalon Aviary they must be approved through our home-qualifying interview process. Sometimes it seems like it would be fun to have a parrot, but it may not be the right pet for you. 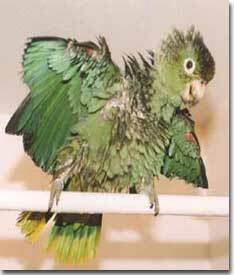 See our articles about deciding if a parrot is right for you for more information. Here at Avalon Aviary, our breeding birds also have good lives. Avalon's healthy breeding birds live comfortably in a state-of-the-art breeding facility. They are fed the best possible diet, observed on a daily basis and are visited by excellent avian veterinarians, both traditional and holistic, to keep them in tip-top condition. They listen to sounds of the rainforest and nature-inspired music, and it rains on them several times a day from our misters. All of our breeding birds have plenty of toys. They have full spectrum lighting including dawn and dusk with a varying diurnal cycle to give them some sense of seasons. Fresh air exchanges 10 times an hour, and visual barriers provide them privacy. Education at Avalon Aviary is a never-ending process. We believe in continuous education for our customers, our birds and ourselves. We offer educational seminars for bird owners covering a range of topics. These seminars are included with the purchase of our birds, and they are offered to others for a small fee. Parrot intelligence has been estimated by Irene Pepperberg to be that of a gifted five-year-old human. While parrots clearly are not the same as children, they are incredibly intelligent creatures that need a variety of stimulation in their lives to develop to their full capacities. Not only can these fascinating birds easily learn, they can also train their owners! They are raised with little to no nurturing guidance to help them regulate their behavior, especially apparent when they become adolescent (around 2 years old). An insufficient sense of security during crucial developmental stages, potentially leading to irrational fears and phobias later in life. Improper socialization with people, birds and familiarization with common household objects, potentially leading to fears and more extreme acting-out during adolescence. They were not allowed to learn to fly and to land, and probably had severe wing clipping, that shatters self-confidence and prevents the awareness that they can make complex decisions in the moment, leading to behavior problems during adolescence and later in life. They were probably hand fed with feeding tubes and force-weaned with poor dietary preferences, encouraging insecurity and malnutrition, both of which can be the underlying causes of significant behavior problems and can also be life-shortening. Without sufficient information, new owners cannot know what they are getting into, and cannot select the right kind of parrot for their situations or know how to care for it properly when they get it home. The sweet innocent babies, bought by well-meaning, unsuspecting people, grow up to become problem adult birds. Without proper guidance, these birds can develop significant behavioral problems. Many of these birds bounce from home to home, developing even more insecurities. The lucky ones find good, understanding homes. The unlucky ones are abandoned in a corner with no toys, poor diets, dirty cages and no attention for the rest of their miserable lives. In one of the worst-case scenarios, the heartbroken and lonely bird screams for attention only to have a blanket put over its cage for longer and longer periods of time until the bird lives virtually its entire life in darkness. We send a portion of our profits to The Gabriel Foundation, one of the finest bird rescue, rehabilitation, placement, education and sanctuary programs in the United States. Finally, we support conservation by sending a portion of our profits to organizations that have proven track records of success with helping preserve and expand wild populations to ensure their continuation in the wild. We also occasionally participate in field biology excursions to be able to observe wild parrot behaviors. Sometimes we see wild behaviors that help explain captive behaviors, or that spark ideas for improving our practices. We are also raising a few species that are threatened in the wild in hopes that sustainable captive populations can be built in case their wild cousins cannot sustain themselves in the wild. We allow many of these birds to be at least partially parent-reared so they could become parents of future generations. Avalon Aviary seeks to raise the absolutely best hand-raised parrots possible, according to strong ethical standards and practices. We provide public education, and support rescue, rehabilitation, sanctuary and conservation programs. We are trying to make a difference in the lives of parrots, wherever they are. Please support us so we can continue our activities by purchasing birds from us, or items from our bird supply store, and by passing on our information to those who might be interested.